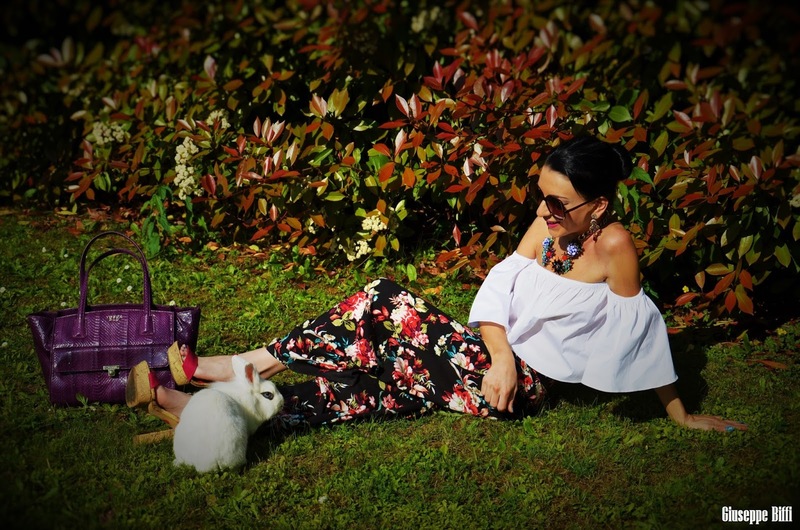 today I want to share with you a spring outfit realized at home, in my village in Italy with my father as photographer and my bunnies as special models!!! I love animals since I was a child....I always wanted to have a dog (my favourite is Pomeranian) but needs a lot of care and attention, so I opted for fishes and bunnies. I've Sissi (the brown bunny-the boss-) and Cherie (the white one) since 5 years and half....They live in my home, now with my parents 'cause I live in Spain since 3 years, and they always were totally free, I never kept them in a cage( I'm against this)....Sissi, as you could see, is my favourite (we were born the same day-8th of September-) and Cherie has a strong personality (2 years ago she has been operated 4 times for a bad disease, but thanks to my mum and my veterinary's cares she's healed). oggi voglio condividere con voi un look primaverile realizzato a casa mia, nel mio paese in Italia, con mio padre come fotografo e le mie conigliette come modelle!!! Amo gli animali sin da quando ero piccola...Ho sempre desiderato un cane (il mio preferito è il Volpino di Pomerania) ma essendo un animale assai impegnativo ho optato per pesci e conigli. Ho Sissi (la coniglia marrone- il capo-) e Cherie (la bianca) da 5 anni e mezzo...Vivono in casa, ora con i miei genitori dato che vivo in Spagna da 3 anni e sono totalmente libere, non sono mai state rinchiuse in gabbia (sono contraria a ciò)...Sissi, come potrete intuire, è la mia preferita (siamo nate lo stesso giorno- 8 settembre-) e Cherie ha un carattere molto forte (2 anni fa si è ammalata e ha subito 4 operazioni, ma grazie alle cure di mia mamma e della veterinaria è guarita). Omgosh you have an adorable furry family!!! I have 3 small dogs and totally understand how much pets mean to us! 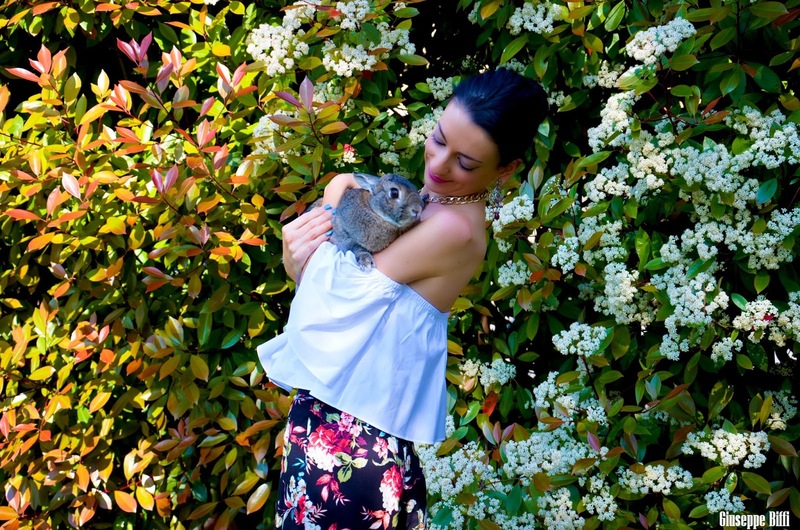 Cherie and sissi look so cute and amazing and your love for animals is so genuine. 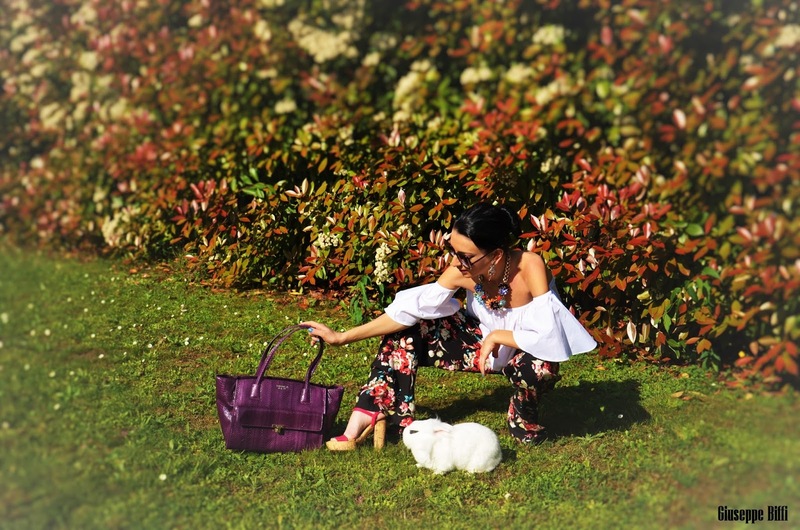 Your photos are amazing and so if your outfit, I love the styling of the off shoulder top and print trousers! Bellissima tu e dolcissime le tue creaturine! Condivido l'amore per gli animali, sono esseri speciali! Oh my gosh, SO cute! I wish I had a pet so badly!! 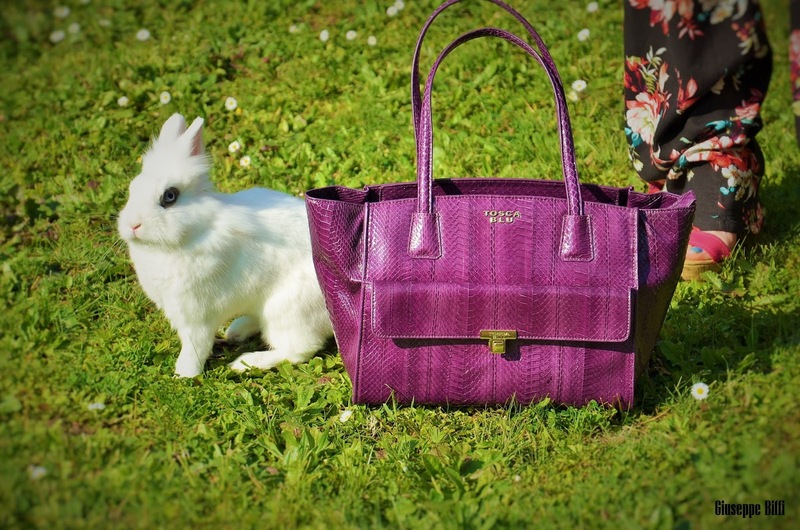 Loving this fun spring post as well. :) Your top is so pretty! STOP! This is SO adorable!! I have been wanting a bunny so badly. These photos are so cute! You have so cute bunny pets! this is soooo sweet!!! Adorable!! Thank you so much Salome!Have a nice day! Beautiful look and photos, I like your pants. Thanks Isabel!!!! Pants are trendy and very comfy! Ma quanto sono deliziose le tue conigliette!!! *-* Si vede che sono trattate con cura e amore! I am sorry but this blog post is just to cute and clever! ALSO, THAT NECKLACE!!!! Thanks Carol! 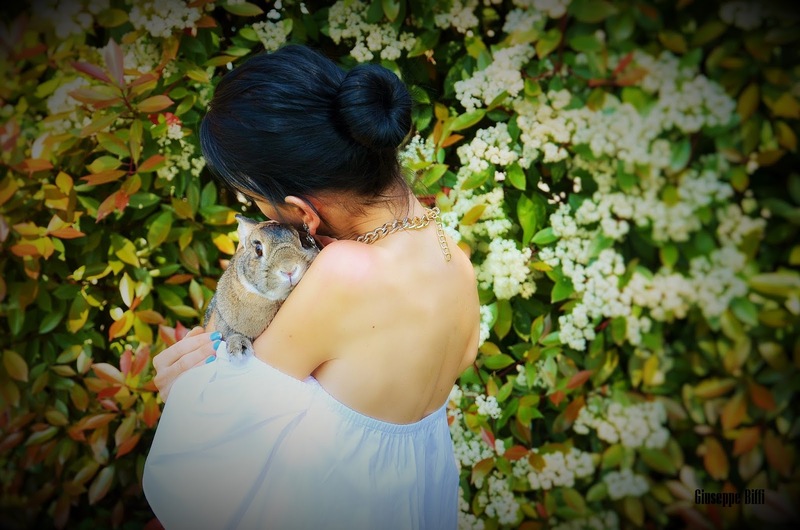 I'm sorry for your bunny, hope you'll have a new pet who will give you a lot of love! So cute!! Loving the look! Thanks Beatriz!!! Have a nice day! omg soo cute! I love these photos! In love with your floral pants! So fantastic! Nice outfit!! I love sandals and bag. Thanks Zara! Have a nice day! Me encantan los pantalones, son preciosos. Awww, how CUTE! Thanks for sharing these shots! Absolutely love your pants and love how you styled it. And your furry friends are such cuties. Beautiful post! I like your top :) Kisses!! The cuteness is too much! Your bunnies are adorable and you look beautiful! She has incredible eyes....it's a natural permanent make-up ehehe! How adorable. 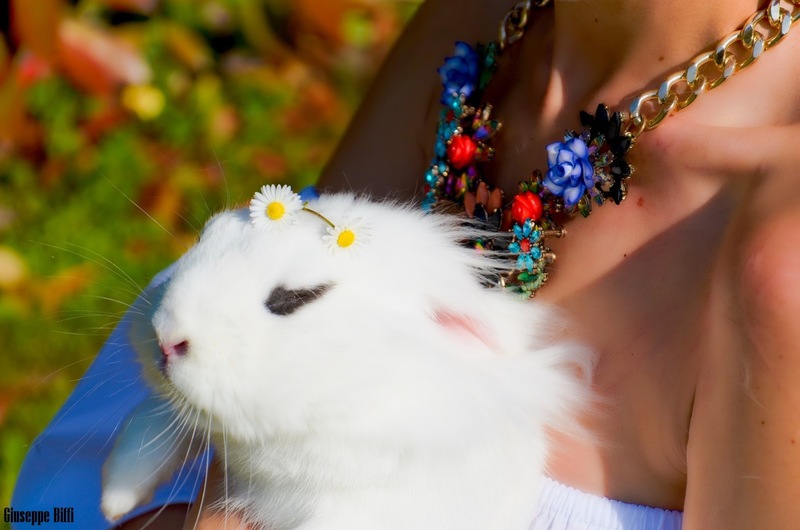 Not only are the bunnies cute, but your outfit is pretty spectacular. In love with your floral pants! Thank you so much!!! I like too this comfy and fashionable spring outfit! Aww so cute!! :) Pets are the best! Thanks Maggie! They are part of the family....I can't imagine to stay without them! Thank you so much Katarina!!!!!! Aww, your rabbits are beautiful! You look lovely together! Me ha encantado el outfit, sobretodo el top! Muchisimas gracias Raquel! Yo tmb adoro el top!!! che carini!anch'io avevo un coniglietto :-)mi piacciono i tuoi pantaloni e adesso penso di scegliere simili https://stileo.it/pantalone-a-palazzo-con-fantasia-floreale-orientale-rouge_13126264 -che ne pensi? insomma, hai un look perfetto.